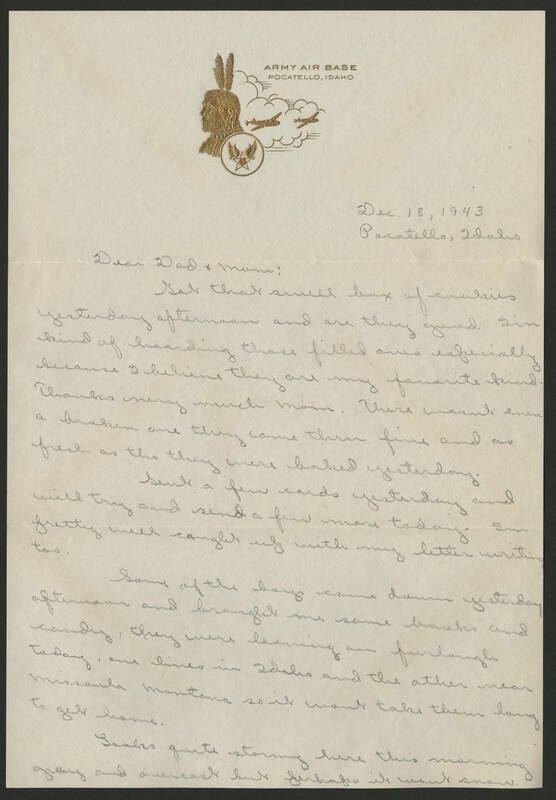 Dec. 18, 1943 Pocatello, Idaho Dear Dad & Mom: Got that swell box of cookies yesterday afternoon and are they good. I'm kind of hoarding those filled ones especially because I believe they are my favorite kind. Thanks very much Mom. There wasnt even a broken one they came thru fine and as fresh as tho they were baked yesterday. Sent a few cards yesterday and will try and send a few more today. Im pretty well caught up with my letter writing too. Some of the boys came down yesterday afternoon and brought me some books and candy, they were leaving on furlough today, one lives in Idaho and the other near Missoula Montana so it wont take them long to get home. Looks quite stormy here this morning gray and overcast but perhaps it wont snow.